For users of Legacy Family Tree software, the new “book” by Geoffrey Rasmussen is required reading. 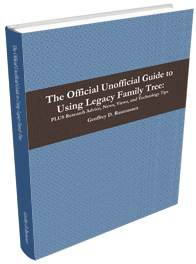 Titled The Official Unofficial Guide to Using Legacy Family Tree, the book was just released this past month. I have been using Legacy for a couple of years, replacing my long relationship with PAF. I’m about a third of the way through the new book – slow going because with each new tip, you just have to go to the computer and give it a try on your own family file! Even for experienced users, there is something new to learn. My favorite thus far is the tool to commit “intelli-murder” – more officially called the Advanced Set Living Feature. A great addition to every users’ Legacy Toolbox. You’ll have to read for yourself why this is useful, but I’ll tell you I “murdered” about 484 relatives in my tree with the first use! The book is loosely organized around some general topics, but is really a series of tips and tricks compiled by Mr. Rasmussen. Well worth the $19.95 price. Congrats to Geoff on a worthy publication. Thanks, Todd, for your review of this book. I have been debating whether to order it. I have been using Legacy for perhaps three years and love it! I enjoyed your website, too.